Three Strikes and You’re Still IN! Sometimes we get so caught up in football…particularly when it extends over into the next year (literally) that basketball season is over in a blink and suddenly it’s “Take me out to the Ball Game” time! I have to admit that after football, baseball is my favorite sport. 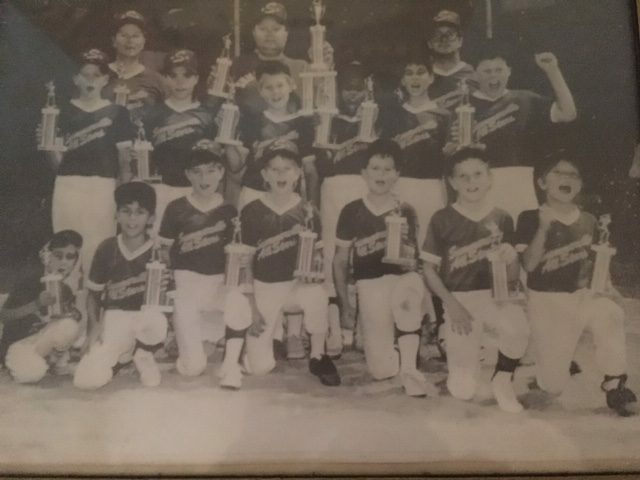 I think it all goes back to being a mother with two sons on the same team one season (Walsh as a 10-year-old player and Tommy as their 5-year-old ball boy and mascot- Tommy is on the front row extreme left and Walsh is on the second row…second to the right.) This was the miraculous year when their team won the whole “enchilada” in their age division in the lowcountry! *Confidentially I liked baseball because I could go settle in the bleachers for their practices…stick my white winter legs out in the sun on another bleacher, roll up my sleeves, and get a jump on a summer tan. (How little did we know?) Half the time I would find myself nodding off…after teaching school all day …sitting on the bleachers in the warm early spring afternoons made my eyes start fluttering a few minutes after I sat down. But that particular year I have to admit I had mixed feelings (like most of the team parents watching if they were really truthful) about how far we really wanted the season to go. From the time sports started in elementary school…summer vacation time got smaller and smaller until by high school it had disappeared. Baseball went into football and good-bye summer. However the joy that night as the team won the grand prize for their division actually did make up for a vacation…watching both Walsh and Tommy getting their trophies with wonderful coaches who were the best male mentors a mother could hope for…they made the season even more special. Walsh would go on to love baseball and play it in high school…Tommy decided he liked another type of ball that came with a golf club….both boys excelled in their different sports passions. How true! Don’t we humans take the fun out of sports games too often with young children… by getting caught up in our man-made “rules” and meticulous record-keeping? Aren’t we glad God doesn’t do the same to us as we learn more about this game called life with experience after experience? 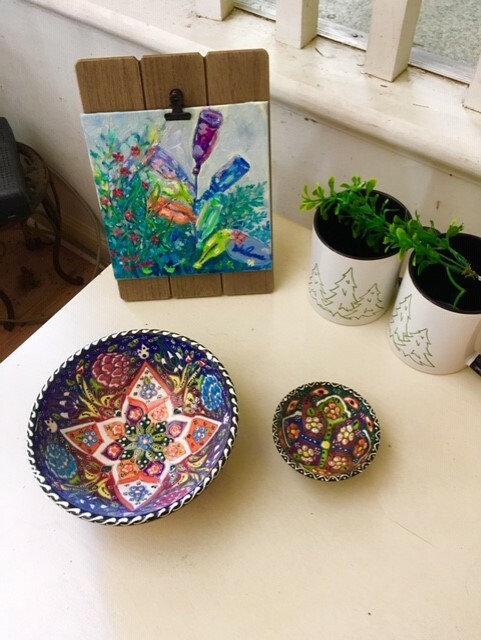 *As I walked by one of my tables today I noticed just how pretty it was with a new beautiful bowl set Lee and Vikki gave me at Christmas and an original oil painting of my bottle tree (that Joan did from a photo taken from an earlier blog post.) You are so talented my friend Joan…and I love, love, love the painting! 6 Responses to Three Strikes and You’re Still IN! And now parents think they need to start the little ones on sports at 4 or 5 years old. To much of a good thing. If we would just let it be child’s play…it would be okay…but adults have a way of messing that up with adding competition too early…thus taking the freedom of just plain fun away. I really loved this thought about no 3 strikes and you’re out with God. Now isn’t that a wonderful analogy or connection to make. I really enjoy sports, and now every time that ump raises his thumb and says, “You’re out!”, I will smile and think, “No way, he’s/she’s safe.” I missed seeing Pooh today, (you know he and his friends are my favorite characters), but I know every day we rise, it is indeed a favorite day because there is a clean sheet to write on and many strikes and hits before we close out the game today Aren’t we lucky to know Who is in charge of our game? I m so glad God is ‘umpiring’ my life and helping me get around the bases…especially cluing me in when it is time to slide in home….knowing that we will be “safe” no matter what. Thanks for the reminder that poor Winnie and his favorite day got left out….I just got Winnie back in so here comes our favorite day…today! Gin-g…I keep thinking the same thing…there weren’t enough hours in the day to be as many places as we were running every day dropping off and picking up kids…thank goodness for the family/close friend saints who helped make it work…some way some how.